Apple might be pulling a Samsung. 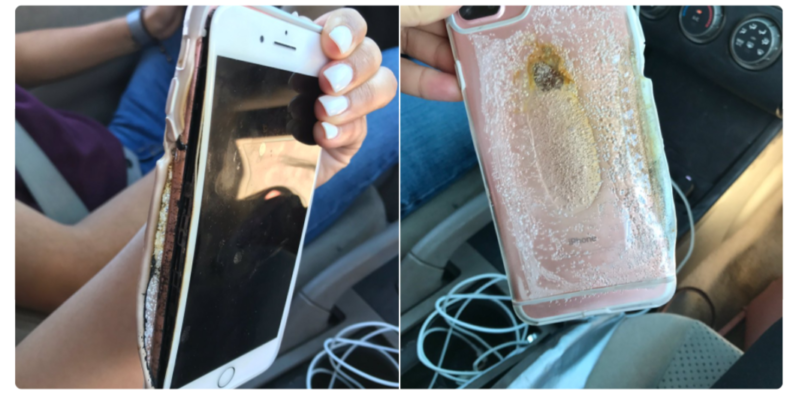 This Wednesday, an Arizona-based teenager shared a distressing video that shows her iPhone 7 Plus excessively release fumes after spontaneously heating up to the point of melting. The footage reveals a gaping hole on the side of the handset as the screen has almost fully melted away from the aluminium frame anchoring. The post, shared on Twitter by Brianna Olivas, has since gone viral, accumulating over one million views and 24,000 retweets. Now Apple has taken notice. In a brief statement to Mashable, the Cupertino titan said the company is “in touch with the customer and looking into” the malfunction. Olivas told Mashable the issues with her iPhone device, which she copped from Sprint earlier in January, began manifesting the day before. After experiencing problems turning on the phone, she took it to the Apple Store where employees ran diagnostics and told her nothing seems to be wrong with the handset. While the iPhone appeared to be functioning properly, things took a turn for the worse on the next morning when it started melting down. Olivas has since handed over the faulty handset to Apple. The company is yet to comment on the issue in more detail, but as of now nothing seems to suggest the flaw is more widespread. While the Cupertino giant has previously dealt with complaints about unexpected shutdowns and flickering screens on the iPhone 6, reports about fire-catching Apple devices have been scarce – though not entirely non-existent. In the heat of the Samsung Galaxy Note 7 battery disaster, a surfing instructor from Australia claimed his iPhone 7 burst into flames and set his car ablaze. The man said he left his phone wrapped in a pair of pants only to discover his car filled with smoke when he returned. Unlike him, though, Olivas claims she did nothing to her device that could’ve chained the meltdown.